Claims of the existence of other moons of Earth—that is, of one or more natural satellites that orbit Earth, other than the Moon—have existed for some time. Several candidates have been proposed, but none has been confirmed. Since the 19th century, scientists have made genuine searches for more moons, but the possibility has also been the subject of a number of dubious non-scientific speculations as well as a number of likely hoaxes. Although the Moon is Earth's only natural satellite, there are a number of near-Earth objects (NEOs) with orbits that are in resonance with Earth. These have been called, inaccurately, "second", "third" or "other" moons of Earth. Other small natural objects in orbit around the Sun may enter orbit around Earth for a short amount of time, becoming temporary natural satellites. To date[update], the only confirmed example has been 2006 RH120 in Earth orbit during 2006 and 2007, though further instances are already predicted. The first major claim of another moon of Earth was made by French astronomer Frédéric Petit, director of the Toulouse Observatory, who in 1846 announced that he had discovered a second moon in an elliptical orbit around Earth. It was claimed to have also been reported by Lebon and Dassier at Toulouse, and by Larivière at Artenac Observatory, during the early evening of March 21, 1846. Petit proposed that this second moon had an elliptical orbit, a period of 2 hours 44 minutes, with 3,570 km (2,220 mi) apogee and 11.4 km (7.1 mi) perigee. This claim was soon dismissed by his peers. The 11.4 km (37,000 ft) perigee is similar to the cruising altitude of most modern airliners, and within Earth's atmosphere. Petit published another paper on his 1846 observations in 1861, basing the second moon's existence on perturbations in movements of the actual Moon. This second moon hypothesis was not confirmed either. Petit's proposed moon became a plot point in Jules Verne's 1870 science fiction novel Around the Moon. In 1898 Hamburg scientist Dr. Georg Waltemath announced that he had located a system of tiny moons orbiting Earth. He had begun his search for secondary moons based on the hypothesis that something was gravitationally affecting the Moon's orbit. Waltemath described one of the proposed moons as being 1,030,000 km (640,000 mi) from Earth, with a diameter of 700 km (430 mi), a 119-day orbital period, and a 177-day synodic period. He also said it did not reflect enough sunlight to be observed without a telescope, unless viewed at certain times, and made several predictions of its next appearances. "Sometimes, it shines at night like the sun but only for an hour or so." E. Stone Wiggins, a Canadian weather expert, ascribed the cold spring of 1907 to the effect of a second moon, which he said he had first seen in 1882 and had publicized the find in 1884 in the New-York Tribune when he put it forward as probable cause of an anomalous solar eclipse of May of that year. He said it was also probably the "green crescent moon" seen in New Zealand and later in North America in 1886, for periods of less than a half-hour each time. He said this was the "second moon" seen by Waltemath in 1898. Wiggins hypothesized that the second moon had a high carbon atmosphere but could be seen occasionally by its reflected light. The existence of these objects put forward by Waltemath (and Wiggins) was discredited after the absence of corroborating observation by other members of the scientific community. Especially problematic was a failed prediction that they would be seen in February 1898. The August 1898 issue of Science mentioned that Waltemath had sent the journal "an announcement of a third moon", which he termed a wahrhafter Wetter und Magnet Mond ("real weather and magnet moon"). It was supposedly 746 km (464 mi) in diameter, and closer than the "second moon" that he had seen previously. In 1918, astrologer Walter Gornold, also known as Sepharial, claimed to have confirmed the existence of Waltemath's moon. He named it Lilith. Sepharial claimed that Lilith was a 'dark' moon invisible for most of the time, but he claimed to be the first person in history to view it as it crossed the Sun. In 1926 the science journal Die Sterne published the findings of amateur German astronomer W. Spill, who claimed to have successfully viewed a second moon orbiting Earth. In the late 1960s John Bargby claimed to have observed over ten small natural satellites of Earth, but this was not confirmed. William Henry Pickering (1858–1938) studied the possibility of a second moon and made a general search ruling out the possibility of many types of objects by 1903. His 1922 article "A Meteoritic Satellite" in Popular Astronomy resulted in increased searches for small natural satellites by amateur astronomers. Pickering had also proposed the Moon itself had broken off from Earth. At a meteor conference in Los Angeles in 1957, Tombaugh reiterated that his four-year search for natural satellites had been unsuccessful. In 1959, he issued a final report stating that nothing had been found in his search. It was discovered that small bodies can be temporarily captured, as shown by 2006 RH120, which was in Earth orbit in 2006–2007. In 2010, the first known Earth trojan was discovered in data from Wide-field Infrared Survey Explorer (WISE), and is currently called 2010 TK7. In 2011, planetary scientists Erik Asphaug and Martin Jutzi proposed a model in which a second moon would have existed 4.5 billion years ago, and later impacted the Moon, as a part of the accretion process in the formation of the Moon. In 2018, it was confirmed two dust clouds orbited earth at L4 and L5  which were possibly moons in the past. The aforementioned dust clouds were nicknamed "Earth's hidden moons". When observed from Earth, Cruithne follows the yellow path which does not appear to circle the Sun. Although no other moons of Earth have been found to date, there are various types of near-Earth objects in 1:1 resonance with it, which are known as quasi-satellites. Quasi-satellites orbit the Sun from the same distance as a planet, rather than the planet itself. Their orbits are unstable, and will fall into other resonances or be kicked into other orbits over thousands of years. Quasi-satellites of Earth include 2010 SO16, (164207) 2004 GU9, (277810) 2006 FV35, 2002 AA29, 2014 OL339, 2013 LX28, 2016 HO3 and 3753 Cruithne. Cruithne, discovered in 1986, orbits the Sun in an elliptical orbit but appears to have a horseshoe orbit when viewed from Earth. Some went as far to nickname Cruithne "Earth's second moon". The key difference between a satellite and a quasi-satellite is that the orbit of a satellite of Earth fundamentally depends on the gravity of the Earth–Moon system, whereas the orbit of a quasi-satellite would negligibly change if Earth and the Moon were suddenly removed because a quasi-satellite is orbiting the Sun on an Earth-like orbit in the vicinity of Earth. Earth possesses one known trojan, a small Solar System body caught in the planet's gravitationally stable L4 Lagrangian point. This object, 2010 TK7, is roughly 300 metres across. 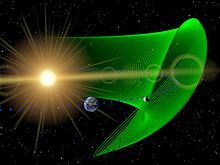 Like quasi-satellites, it orbits the Sun in a 1:1 resonance with Earth, rather than Earth itself. On 14 September 2006, an object estimated at 5 meters in diameter was discovered in near-polar orbit around Earth. Originally thought to be a third-stage Saturn S-IVB booster from Apollo 12, it was later determined to be an asteroid and designated as 2006 RH120. The asteroid re-entered solar orbit after 13 months and is expected to return to Earth orbit after 21 years. Computer models by astrophysicists Mikael Granvik, Jeremie Vaubaillon, and Robert Jedicke suggest that these "temporary satellites" should be quite common; and that "At any given time, there should be at least one natural Earth satellite of 1-meter diameter orbiting the Earth." Such objects would remain in orbit for ten months on average, before returning to solar orbit once more, and so would make relatively easy targets for manned space exploration. "Mini-moons" were further examined in a study published in the journal Icarus. It has been proposed that NASA search for temporary natural satellites, and use them for a sample return mission. In April 2015, an object was discovered orbiting the Earth, and initially designated 2015 HP116, but more detailed investigation quickly showed the object to be the Gaia spacecraft, and the object's discovery soon was retracted. On October 3, 2015, a small object, temporarily designated WT1190F, was found to be orbiting the Earth every ~23 days, and had been orbiting since at least late 2009. It impacted the Earth on November 13, 2015 at 06:18:34.3 (±1.3 seconds) UTC. On February 8, 2016 a 0.5-meter object was discovered orbiting the Earth with a period of 5 days and given the temporary designation XC83E0D, and most likely lost. The object was later identified with the lost artificial satellite SR-11A, or possibly its companion SR-11B, which were launched in 1976 and lost in 1979. On April 8, 2016, an object, given the temporary designation S509356, was discovered with an orbital period of 3.58 days. Although it has the typical area-to-mass ratio (m^2/kg) of satellites, it has a color typical of S-type asteroids. It was later identified as the Yuanzheng-1 stage from the launch of Chinese navigation satellites. On December 8, 2017, the object YX205B9 was discovered with an orbital period of 21 days, on an eccentric orbit taking it from slightly beyond the geocentric satellite ring to almost twice the distance of the Moon. It was later identified as the booster stage from the Chang'e 2 mission. The writer Jules Verne learned of Petit's 1861 proposal and made use of the idea in his 1865 novel, Around the Moon. This fictional moon was not, however, exactly based on the Toulouse observations or Petit's proposal at a technical level, and so the orbit suggested by Verne was mathematically incorrect. Petit died in 1865, and so was not alive to offer a response to Verne's fictional moon. Seun Ayoade's science-fiction adventure Double Bill has a twin-mooned parallel earth. Eleanor Cameron's Mushroom Planet novels for children (starting with the 1954 The Wonderful Flight to the Mushroom Planet) are set on a tiny, habitable second moon called Basidium in an invisible orbit 50,000 miles (80,000 km) from Earth. There is an even smaller moon called Lepton orbiting at only 1,000 miles (1,600 km). The 1956 Tom Swift, Jr. juvenile novel, Tom Swift on the Phantom Satellite, features a new moon entering Earth orbit at 50,000 miles (80,000 km) altitude. A 1963 sequel, Tom Swift and the Asteroid Pirates, has the moon Nestria, also called Little Luna, which was originally an asteroid and was moved into Earth orbit at 50,000 miles (80,000 km) altitude. It was claimed for the United States and a research base was established there by Swift Enterprises. Samuel R. Delany's 1975 novel Dhalgren features an Earth that mysteriously acquires a second moon named George. In Haruki Murakami's 2011 novel 1Q84, a second moon, irregularly shaped and green in color, is visible to some characters in the story. ^ a b c d "Mystery Mini Moons: How Many Does Earth Have?". DNews. ^ Drye, Paul (2009-01-24). "Earth's Other Moon". passingstrangeness.wordpress.com. Retrieved 2011-10-23. ^ Agle, DC; Brown, Dwayne; Cantillo, Laurie (15 June 2016). "Small Asteroid Is Earth's Constant Companion". NASA. Retrieved 15 June 2016. ^ a b Ley, Willy (July 1957). "For Your Information". Galaxy Science Fiction. pp. 61–71. Retrieved 11 June 2014. ^ "Science". VIII (189). 12 August 1898: 185. Retrieved 25 August 2013. ^ "Forming the lunar farside highlands by accretion of a companion moon". Nature. 476: 69–72. Bibcode:2011Natur.476...69J. doi:10.1038/nature10289. ^ Brasser, R.; et al. (September 2004). "Transient co-orbital asteroids". Icarus. 171 (1): 102–109. Bibcode:2004Icar..171..102B. doi:10.1016/j.icarus.2004.04.019. ^ "Dynamical evolution of Earth's quasi-satellites: 2004 GU9 and 2006 FV35". Bibcode:2010Icar..209..488W. doi:10.1016/j.icarus.2010.05.012. ^ a b Granvik, Mikael; Jeremie Vaubaillon; Robert Jedicke (December 2011). "The population of natural Earth satellites". Icarus. 218: 63. arXiv:1112.3781. Bibcode:2012Icar..218..262G. doi:10.1016/j.icarus.2011.12.003. ^ a b Amy Shira Teitel (2011). "Earth's Other Moons". Universe Today. Retrieved 2012-02-04. ^ "Earth's Many Moons - Astrobiology Magazine". Astrobiology Magazine. ^ Chant, Clarence A. (May–June 1913). "An Extraordinary Meteoric Display". Journal of the Royal Astronomical Society of Canada. 7 (3): 144–215. Bibcode:1913JRASC...7..145C. ^ Denning, William F. (April 1916). "The Remarkable Meteors of February 9, 1913". Nature. 97 (2426): 181. Bibcode:1916Natur..97..181D. doi:10.1038/097181b0. ^ "New Asteroid-Capture Mission Idea: Go After Earth's 'Minimoons'". Space.com. ^ "MPEC 2015-H125: DELETION OF 2015 HP116". www.minorplanetcenter.net. ^ "Pseudo-MPEC for 2015-019C = NORMAD 41929 = S509356 = WJ2AD07". Project Pluto. Retrieved 4 July 2018. ^ "On-line artificial satellite identification". Project Pluto. Retrieved 4 July 2018. ^ "Pseudo-MPEC for 2010-050B = RV223A9 = Chang'e 2 hardware". Project Pluto. Retrieved 4 July 2018. ^ "History of the Toulouse Observatory" (in French). Archived from the original on 2009-05-28. ^ "The Mushroom Planet Series". Retrieved 2014-05-13. ^ "Tom Swift on the Phantom Satellite". Retrieved 2014-05-13. ^ "Tom Swift and the Asteroid Pirates". Retrieved 2014-05-13. ^ Pierce, John J. (1989). When World Views Collide: A Study in Imagination and Evolution. Contributions to the study of science fiction and fantasy. Greenwood Press. p. 108. ISBN 0313254575. Retrieved 2014-05-13. ^ Judith Eve Lipton, MD (November 18, 2011). "1Q84: Living in a World With Two Moons". Psychology Today. Retrieved 2014-05-13. Research paper describing horseshoe orbits. William R. Corliss: "Mysterious Universe: A handbook of astronomical anomalies", Sourcebook Project 1979, ISBN 0-915554-05-4, p 146–157 "Other moons of the Earth", pp. 500–526 "Enigmatic objects"
Have astronomers discovered Earth's second moon?